Click Here to Find Mercury Safe Dentists! Dr. Tom McGuire has the largest and most comprehensive Directory of Mercury Safe Dentists & Mercury Free (Amalgam Free) Dentists on the Internet. Dr. McGuire offers a number of products designed to support mercury detoxification and improve your oral and overall health. These include Books, Preventive Dental Products, Mercury Detoxification and Oral Health Care Supplements - including OraMD. • Mercury Free & Mercury Safe: What is the Difference? • Safe Mercury Amalgam Filling Removal Guidelines? The effect of dental disease on overall health can be devastating. Gum disease increases the risk of heart attack and stroke, along with many other debilitating diseases, such as diabetes. Overall health must include oral health! 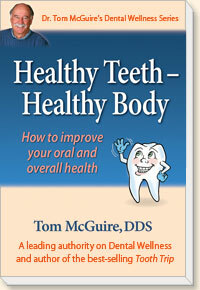 Tom McGuire, DDS is a leading authority on dental wellness, mercury detoxification, and mercury amalgam silver fillings. He is the author of many best selling books, including The Poison in Your Teeth, Healthy Teeth-Healthy Body: How to Improve Your Oral and Overall Health , the Tooth Trip and Mercury Detoxification: The Natural Way to Remove Mercury from Your Body. Mercury Safe Dentists, Mercury Free (Amalgam Free) Dentists, Mercury Detoxification, Safe Amalgam (Silver) Filling Removal, the Relationship of Oral to Overall Health! Are you a Mercury Safe Dentist? Do you know that over 80% of those searching for a Mercury Safe Dentist (amalgam free) and Mercury Free Dentist find them on the Internet? You can establish a Prominent Internet Presence with a Listing on Dr. McGuire's Mercury Safe Dentist Internet Directory. Because Dr. McGuire has the Highest Ranked Mercury Safe Dentist Directory on the Internet, a listing with us means that: "Through us those seeking mercury safe dentists will find you"! Your listing also offers many additional benefits designed to help you promote mercury safe dentistry. To Purchase a Listing . . .
Dr. McGuire's Marketing Program will show you how to easily and cost-effectively grow your Mercury Safe Practice. No marketing experience is necessary and following his step-by-step guidelines will generate new patients and increas revenues! Is Your Dental Practice Mercury Safe? If you aren't sure and want to make certain, then New Directions Dentistry's DVD: How to Minimize Occupational Exposure to Mercury in the Dental Office is for you! It is the only DVD of its kind available to dentists and will teach you how you can protect yourself, your patients, your staff and the environment from excessive and unnecessary occupational exposure to mercury. Six hours of Continuing Education (CE) Credits are available. Want to add an Associate to your practice? Want to sell your Mercury Safe practice? Want to communicate with other Mercury-Safe dentists? Do you want to effectively educate your patients about mercury amalgam fillings, mercury detoxification, and the relationship of oral to overall health? Gum disease will not only lead to costly and painful periodontal surgery but is the number one cause of tooth loss. Be true to your teeth or they will be false to you! We offer a number of Oral Health Care Supplements and Preventive Dental Products designed to help you remove mercury from your body and eliminate dental disease. To review these products click on the links below. Mercury Free & Mercury Safe: What is the Difference? We know Mercury Amalgam (Silver) Fillings release poisonous mercury vapor. We know there is no harmless level of mercury! Yet there are still dentists & patients who refuse to accept these facts! 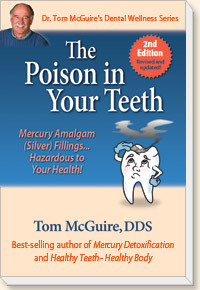 Dr. Tom McGuire’s YouTube Video Mercury: The Poison in Your Teeth provides conclusive quantitative proof that not only do amalgam fillings release toxic mercury vapor - but that the common act of brushing just one amalgam filling - will release more mercury than allowed by governmental regulatory agencies at the workplace. Click Here to watch this amazing video demonstration and don’t forget to tell your friends and family! (Silver) Fillings . . . The Poison in Your Teeth proves that mercury is continuously released from amalgam (silver) fillings. Mercury is the most poisonous, naturally occurring, non-radioactive substance on earth. It contributes to over 100 health issues, including heart disease, autism, chronic fatigue, MS, allergies, depression, memory loss and anxiety . . . to name but a few. Dr. McGuire’s book addresses every aspect of this controversial subject in a way everyone can understand. It is essential reading for anyone who wants to have these fillings safely removed, replaced and improve their overall health. His book is a must read for women who are planning to have a family and are unsure or skeptical about how these fillings affect them, the fetus, nursing baby and child. • Eliminate gum disease and tooth decay. • Improve your oral and overall health and increase your life expectancy. • Avoid or minimize costly gum surgery. • Save thousands of dollars in dental treatment costs. • How to increase your energy and look and feel better. Dr. Tom is also available for telephone consultations regarding mercury detoxification, mercury amalgam fillings, and the effects of gum disease on overall health. 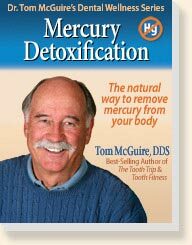 • Mercury poisons the body and how the detoxification process works. • To use healthy natural nutritional supplements to safely remove mercury from your body. • To support brain and intestinal health during detoxification. • To use schedule charts and testing to support and monitor your program. • To heal the damage mercury has done to your health. 3 Books for the Price of 2! $34.90 . . . Save $11.95! Order The Poison in Your Teeth and Mercury Detoxification . . . . . and Get Healthy Teeth - Healthy Body for FREE! Order the Poison and Detoxification eBooks and receive the Healthy Body eBook for Free! 3 eBook Price: $30! Save $9! Learn how Healthy-Teeth and my dental disease prevention program will benefit your patients and make your practice more rewarding and profitable. Utilize Healthy Teeth-Healthy Body and Dr. Tom’s innovative Oral Hygiene Program Guide to eliminate dental disease and improve your oral and overall health!